Discount available! Recommend GSM/GPRS module with SIM800C to your friends and get your Discount. Compact breakout board (45x50 mm) with GSM/GPRS module SIM800C of SIMCom, antenna connector and SIM card holder. It has 2 pin-strip for connections with the basic circuit of GSM remote control, one pin-strip of 3 pins and one of 16 pins; the first provides the positive and the negative of the digital power supply, in addition to the ignition line (PWR) while the second contains all the signals and communication lines from and to the GSM module. 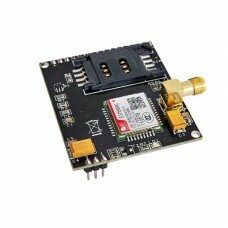 The module comes with GSM antenna (8170-ANTGSMSTL-S01).